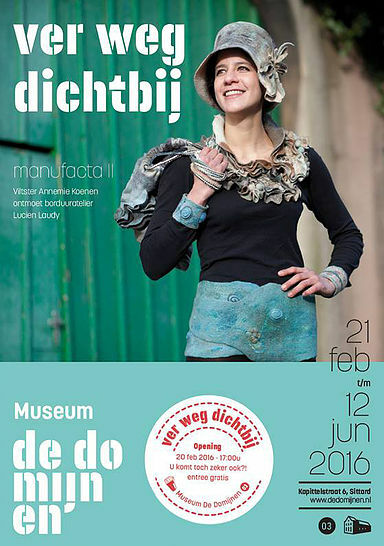 Carla de Ruiter courses and workshops, wool artisan. 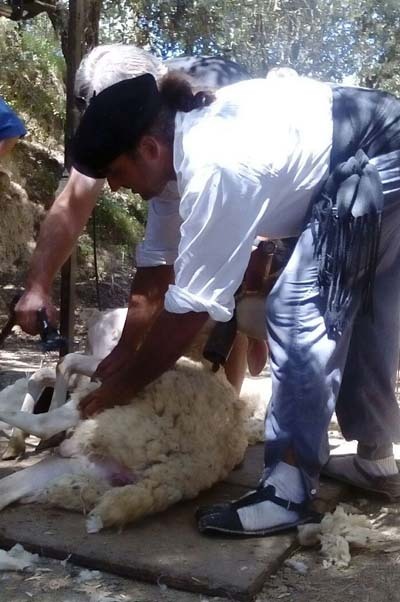 In a one day workshop we learn the initial processes to transform the wool from fleece to textil. 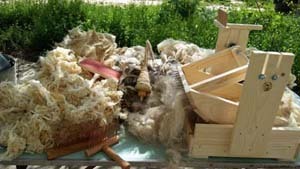 We will learn to sort out the fleeces and to distinguish wool for handicrafts and for other uses. We will learn to wash and dry the wool. 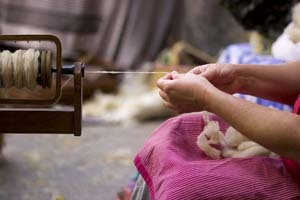 We will learn the processes to prepare the wool for spinning or creating felt. We will experiment with the tools for picking and carding the wool. Woolpicker, drumcarder, handcarders. We will make a small introduction to spinning by experimenting with the rotating bar. We will create a small felt detail to familiarise with the technique. Date: 15th of April 2019. Schedule: Monday 10.00-14.00 h and 16.00-20.00 h.
Price: 70 € per person. Note: The course includes a rotating bar and 500 gr of wool for each participant. Date: 6th of July 2019. Schedule: Saturday 10.00-14.00 h and 16.00-20.00 h.
Place: Albelda - Huesca (Aragón). 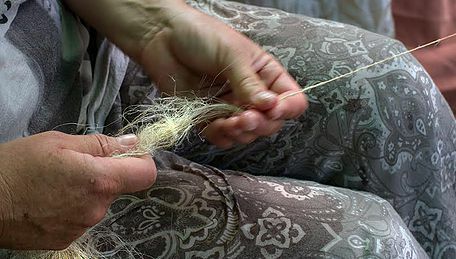 For two days we approach to the craft of the spinner in order to live a unique experience: the spinning of a natural fiber. We get to know the natural fibres of animal origin: wool, mohair; and of vegetal origin: cotton, linen, hemp and wild silk. We will see the characteristics of wool. 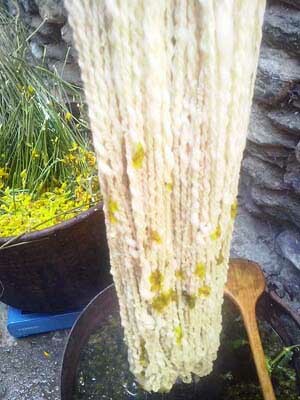 Let's prepare the fibres: cleaning the wool. We get to know spinning tools. We will experiment with the tools to get the thread done. 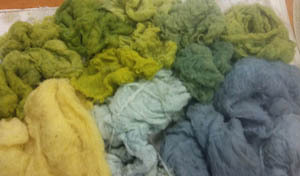 We will mix fibres and colors with hand carders and a drum carder. We will spin with a spindle and a spinning wheel. We will twist two threads to obtain a two-wire yarn. We will make a small primitive fabric with the threads we obtained. Dates: 13th and 14th of April 2019. Hours: Satuday 10.00-14.00 h and 16.00-20.00 h.
Price: 120 € per person. 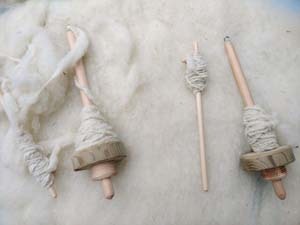 Note: The course includes a spindle and 500 gr of wool for each participant. We'll learn to prepare the skeins. 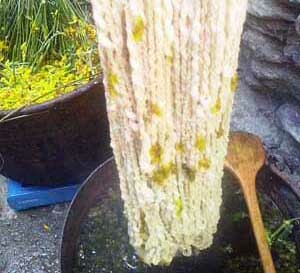 We will learn about the preparation of the wool before dyeing: "mordant the wool". We will learn to prepare the dye baths using plant material. We will experience all together doing the whole process of mordantating, dying and modifying. We will get a range of colors from only 3 or 4 dye bath. 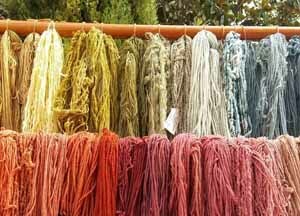 Finally, we will discuss alternatives for dyeing with natural dyes, specifically, solar dyeing and how to repeat it easily at home. We'll work with the blue color "indigo". We will learn to prepare an organic indigo vat. We will learn to dye the wool with the indigo vat. 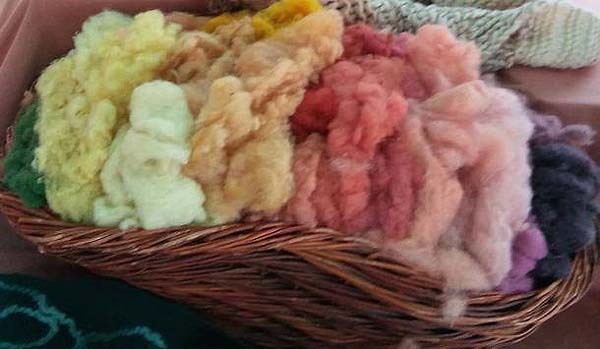 We’ll experiment with the yellow and red wool obtained in the first day and we’ll get green and brown colors. We prepare a sample of the dyed wool and its procedure. Date: 17th and 18th of April 2019. Hours: Wednesday and Thursday: 10:00-14:00 h and 16:00-20:00 h.
Price: € 150 per person. Note: Each participant will take home 800 gr. of dyed merino wool (carded wool) or 400 gr in skeins and a swatch of the obtained colors. 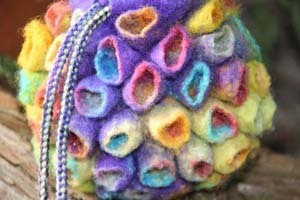 A course for beginners in which we start in different techniques to create felt. The felt comes out working the wool fibers with movement in an aquatic environment or with felting needles. 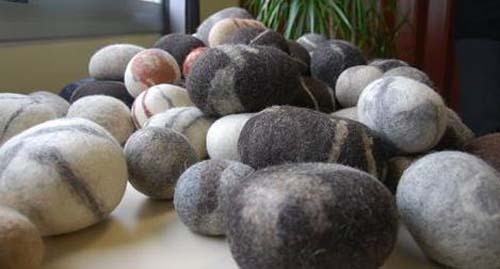 It is a unique quality of wool, although some other natural fibers of animal origin with greater or lesser ease also felt. In the morning we will learn to create balls, churros, rope. With them we will create some costume jewelry. 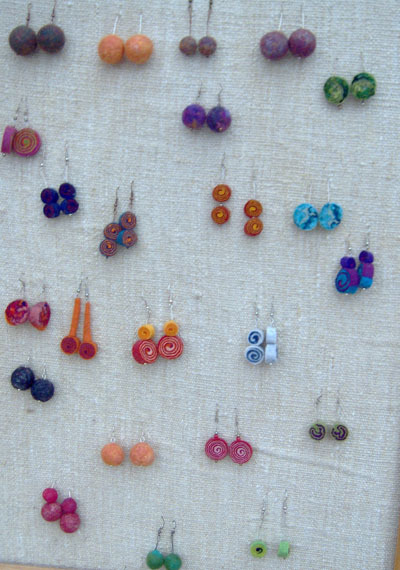 A pair of earrings, a necklace. 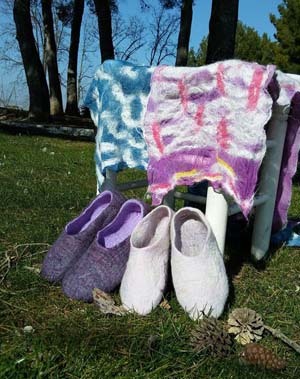 In the afternoon we will learn to make 3-dimensional felt, case, carry glasses or mobile phone case, flowers, light objects or house slippers. Each one will create a piece in 3 dimensions according to their interest. Hours: (8 hours): 10:00-14 h: 00 and 16:00-20:00 h.
Note: The price includes course, material and midday meal. 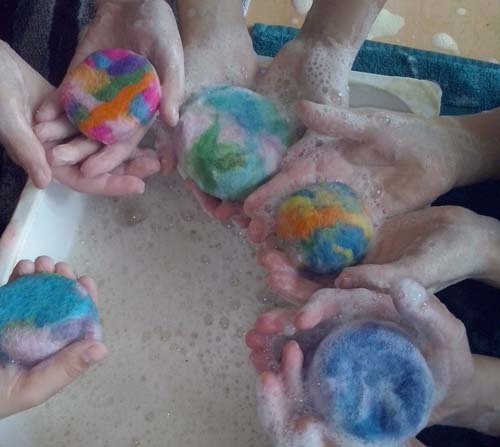 - We learn about the quality of wool which felts when working with hot water and soap. - An midday or evening to work and play with wool in a group with a known material in a totally new and current mode. 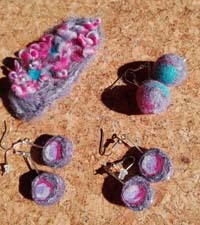 - We create a pair of earrings and a piece of felted soap. Felt is an ancient art that has joined together cultures, people, fibres, creating our clothes to protect us from heat, cold and moisture. Wool confirms us that it unite us to help each other to grow up. Working with the fleece gives people an encounter with nature, Therefore its use is recommended for teachers, therapists, children, adolescents and adults in need of special care. 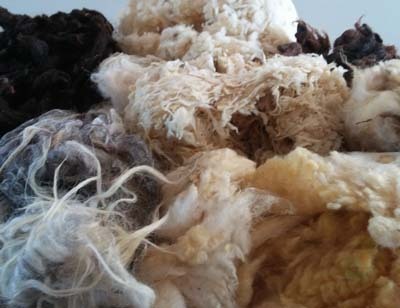 Caloric and delicate subtlety involved in wool arouses great wonder in our senses. By mixing different colors and different textures felt is achieved. The preparation and creation of the felt represents an activity that is currently absent. At this time we are strayed so far from land, that creating felt is the pure experience of to take part in a natural process; It is the mark of our pressure at every step and thereby delivering part of our soul and our conscience to create the fabric. It is resulting in every design and colors surprising to find a material that speaks for itself. Blankets, hats, socks, coats, protection, everything that we can take from our environment without damaging the environment to be in common union and wrap our body in shows over time that to work is a creative act. From the subtle natural fiber to the consolidation of a felted fabric we are going through an artistic and meditative process. Based on these ancestral knowledge of wool offers us today an excellent natural material to develop quite easily current creations, that makes wool a great material to work alongside people with special needs. It is noteworthy that the process to create felt allows per excellence to unite the hands of a student with the hand of an educator and they can both enjoy together the process and contact with wool. Its lure the striking and beautiful result of original, useful piece and most times very nice. Together we are able to get somewhere, where we are not able to come alone. 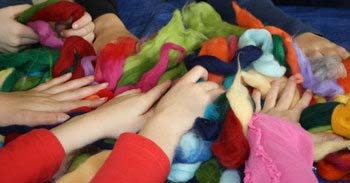 We offer therapeutic felt workshops. 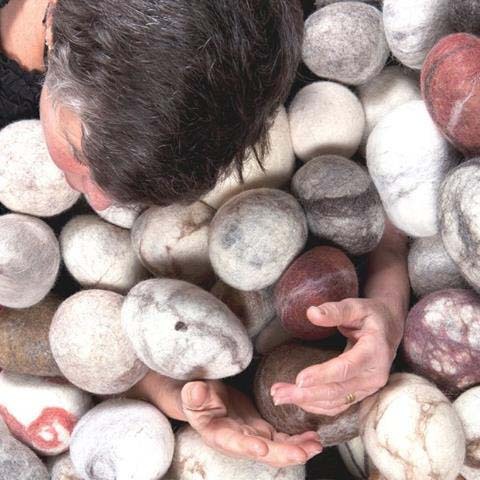 - Annemie (Netherlands) taught textile art for five years at a Waldorf School, and in 1999 she founded her own "Mother Earth" workshop. 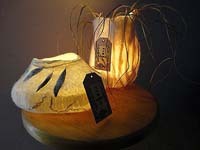 - She draws inspiration from the nature and cultures of distant lands. Her ambition is to maintain techniques and to transmit them. 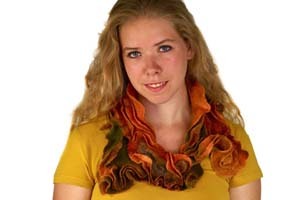 - Since 2007, Annemie has been offering courses on international level to share her know-how on felting acquired in Eastern countries. 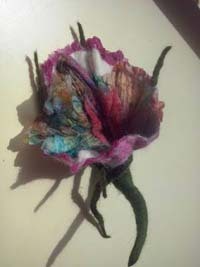 Her great passion is embroidery on felt that she makes mainly intuitive. We can work with many kinds of materials, in many techniques and many designs. 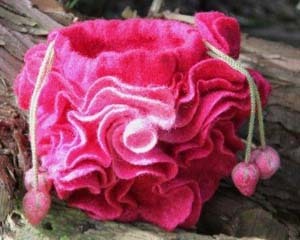 Your work can be an object but also a bracelet, hat, slippers, bowl or whatever you like. Your work can be decorated as desired with embroidery and/or braiding and weaving techniques from Central Asia. If necessary support with design and colour choice. Your own creativity will be appreciated and stimulated. Everyone can work at her own level. Explanation and examples about the different possibilities. Broad, profound knowledge and good transfer of the teaching material and many related matters. For: Teachers and educators of children with special needs; educators of social working places; wool artisans. Organizing and place: Fibrart en Almenar - Lleida. Dates: 9, 10 and 11 of February 2018. Price 3 days: 225 €. For social workers, being involved in a community art project can be among the most rewarding and dynamic experiences. 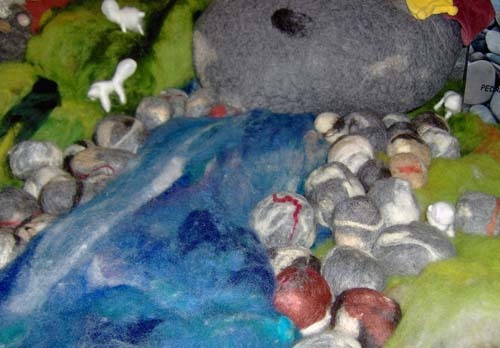 Felt is an excellent medium to work with community art. 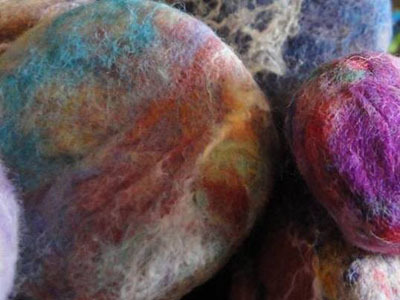 These images are the result of the community art project between mother earth wool workshop from Annemie Koenen, the social working place "La Torxa" in Lleida with Fibrart. 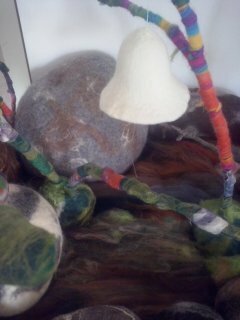 We participated providing 100 felted stones to the exposition of Annemie Koenen in Sittard. 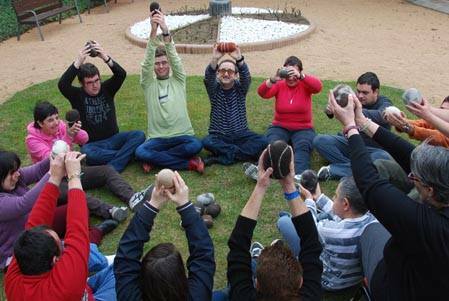 They will take place in "Les Avellanes" Monastery - Lleida, during the month of February 2018.